Did you know you can add, delete, or modify your respondent list for an online survey, even while it is running? We have created a helpful worksheet that shows you how. 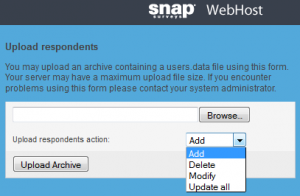 Snap WebHost, our online survey and mobile interviewing management platform, requires respondent information for sending out email invitations and reminders, and any additional details you would like for customizing the emails and questionnaires with any personal data. If that data changes at any time, you can change the respondent list for a survey while the survey is running. This will not delete information about respondents who have already completed the survey.